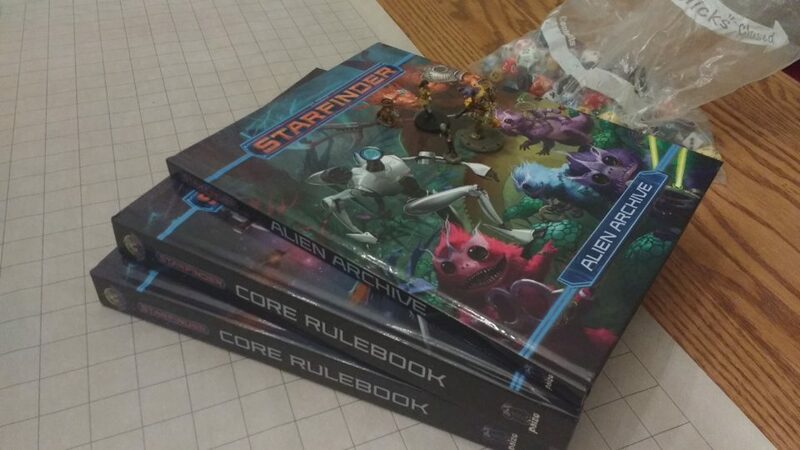 I ordered the Starfinder Core Rulebook over my long break from painting miniatures and have been absolutely won over by it. I’m definitely going to use it for my upcoming Science Fantasy campaign rather than modding Pathfinder… But before creating homebrew content I felt that it was important for me to get a feel for the vanilla rules. Hence scheduling a series of one off dry runs to test out the system. The premise of the one off was simple. The group arrives at a space station, interacts a bit with the locals at their own initiative, and then is caught up in a violent uprising from which they must escape. One of the players was sick the night of so my wife stepped in at the last minute to play as an Anthropomorphic Armadillo named Senorita Not’a’lance (a play on Nautilus). The on foot segment was fantastic. Starfinder implements many mechanical improvements over Pathfinder, some obvious and some more discrete . To my surprise, one of my favorite changes is that a full attack no longer scales off of BAB but only grants two attacks per round. This may sound trivial but after spellcasting and summoning the thing that most often bogged down combat in our Pathfinder campaign was when a character made 5+ attacks in one turn. Starfinder simplifies this by making weapons more powerful but limiting how often they can be used in a single turn. The rulebooks also have a great vibe to them that’s a nice break from the stereotypical fantasy setting. The sitting had great flow and was moving forward surprisingly smoothly for being a new system… Then everything shrieked to a near halt when the group stole a frigate and the starship segment began. All of us had read over the starship of the Core Rulebook, some multiple times, but the learning curve still hit very hard. Starship Combat is almost like an entire second game. It has incredible potential but it’s definitely not something to throw at a new group without expecting it to take a lot of time. I’m going to devote the next dry run entirely to the starship segment of the game. I’m also going to prep instruction cards for each role on the starship and general guidelines. In any case, the group escaped on their stolen frigate after evading pursuit and shooting down several missiles! We did manage to get the basics of maneuvering and weapons down…but still a lot of uncertainty over the Science Officer and Engineer roles.